On April 12th, Nagaraju Koppula lost his battle with cancer, and casteism. A Dalit journalist working in India, Nagaraju faced caste discrimination his entire life—a discrimination that ultimately worked to hinder his treatment and recovery. “He died of cancer, murdered by Manu*”, wrote, with seething anger,clouded by grief, Chittibabu Padavala, a close friend of Nagaraju Koppula,probably the only English journalist from the Madiga community, a Dalit sub-caste,who caved in after a protracted,courageous and consuming struggle with lung cancer on April 12. 4 days prior to that, “I wish he could live”, read an article by Allam Narayana, the chief editor of a well-known Telugu newspaper “Namaste Telangana”, on the life and condition of Nagaraju. Wishes, sometimes, remain just that: wishes. Wistful whispers of weary voices. Nagaraju was born in Sarapaka Village from Bhadrachalam mandal of Krishna District to a family struggling to survive in the margins of a casteist society, wading through the straits of severe socio-economic subjugation. A father, who went missing when he was 4 years old, and a mother striving as a daily wage labourer, along with his five siblings, to keep this wrecking boat afloat. He too had to walk on this beaten track of child labour, as many in this country do every second, each a silent storm in this broken, and ever breaking, cup, at a very young age for the sake of sustenance. A construction labourer, then an ice candy-seller, and eventually a respected artist, who painted sign boards etc.,in his village. With the sheer strength of his relentless hard work and will power in an environment socially, financially and structurally hostile, he managed to complete his M.A in the School of Journalism from the University of Hyderabad, followed by a Diploma in the Indian Institute of Journalism and New Media in Bangalore, supported by scholarships, and trained in investigative journalism and creative writing at the Tehelka School of Journalism in Delhi. Venturing into a field with an abysmal representation of Dalits, discriminated in myriad subtle and not-so-subtle manners, he began his attempts to eke out a living from the profession of journalism. After interning at and freelancing for publications like The Hindu that deemed beneath their ‘merit’ to hire him, he landed a much-needed job at The New Indian Express which for hardly unknown reasons paid him lesser than what they did his fellow reporters. A job,no, something more than it, a dream much dearer, to which he dedicated his heart and soul, latched onto it with a zeal that left one inspired and,even,a bit concerned, expending unmatched energies in pursuit of stories.Nagaraju swept with a stunning stroke of his sincere pen a broad range of reports from the dismal state of health care for mentally ill prisoners swallowing many lives through its numbing apathy to the wildlife species hanging from the edge of extinction in the then Andhra Pradesh. From Nehru Zoological Park hosting four cheetahs from Czech Republic to a mother waiting for three years to meet her children, Nagaraju churned scores of moving and amusing stories, serving ample proof of his journalistic mettle.Consequently, it didn’t take him long to make a mark of his own in the organization inviting well-deserved acclaim. But as it happens, time has an unmistakable penchant for tragedies.His health declined. Weight loss and repeated bouts of coughing pulled him to consult doctors in GovtTB&Chest Hospital where he was faultily diagnosed for TB based on the meagre and clearly insufficient evidence of an X-Ray. As one of his friends notes, “They did not suspect Lung Cancer because Nagaraju was a non-smoker, largely ignoring the fact that about a third of lung cancer cases occur in non-smokers.” However, the treatment, which offered no solace whatsoever, continued for 5 months. When doctors kept ignoring the repeated protestations of Nagaraju that his medical condition is worsening, he visited a private clinic where he was diagnosed with lung cancer based through a lymph node biopsy.During this period of five months, the ruthless apathy and hideous discriminatory attitudes of The New Indian Express administration were starkly palpable, to Nagaraju and his friends. According to them, refusing to provide any sort of financial assistance/health cards, as was the case with his peers, to their employee, forcing him to go on a loss of pay leave for the five months by granting a casual leave only for 12 days, reinforced their belief in the casteist and debilitating labor-hostile environment of the publication, He was able to undergo treatment with the assistance of funds from his friends and colleagues, with a discernible absence of help from media houses or journalist unions, while Nagaraju’s name had been removed from the rolls of the newspaper without any intimation.Ill fate never stopped haunting him. More often than not, kind hearts bear the most bitter wounds.He was at the receiving end of an online fraud, a case of grave cyber robbery, which siphoned off approximately 1.23 lakh rupees from his SBI account, the amount collected for his treatment. A money that would now be smelling of blood and tears in the pockets of the robbers. 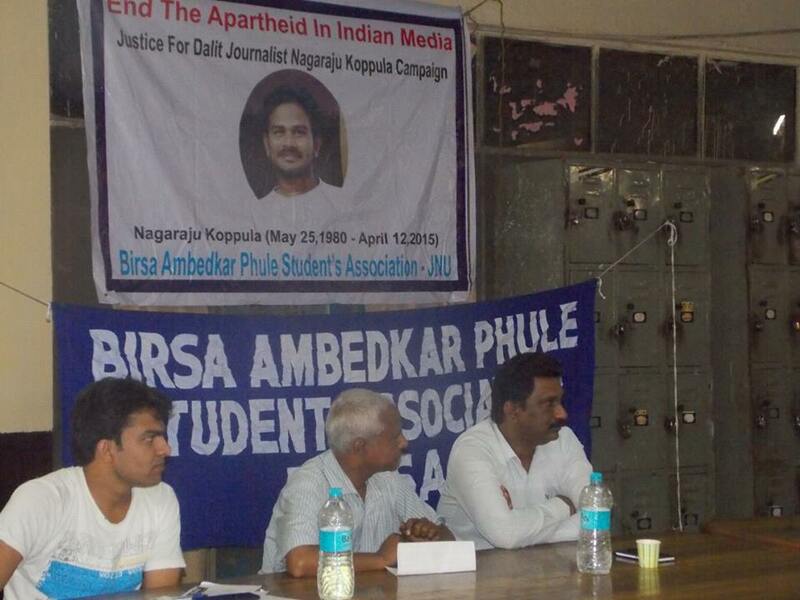 Birsa Ambedkar Phule Students Association of Jawaharlal Nehru University, New Delhi organised a meeting to demand justice for Dalit journalist Nagaraju. A very heart-warming campaign, initiated by his friends and well-wishers, “Justice For Nagaraju” had been afoot to bring to light the grievances of the then bedridden, with unstable consciousness, Nagaraju, to fight for the rightful justice he deserves, to indict The New Indian Express authorities for its casteist crimes, right from the unequal pay to the egregious negligence of his decaying health, demand for radical reforms in the functioning of the Media houses and Journalist Unions and, of course, to raise assistance, financial and moral, to improve the rapidly sinking condition of Nagaraju, a journalist this cursed land didn’t deserve. The campaign had gained traction in social media circles’ and been successful in grabbing the attention of the government, which promised some financial aid, Civil rights activists’ such as famous balladeer Gaddar, intellectuals, artists, journalists, politicians etc. from the state, some of whom visited him personally, lend him their much-needed-support. Protests against the casteist administration of the Indian express were under way in places such as the University Of Hyderabad with encouraging involvement of the students, activists etc. In a press release, the Delhi Union of Journalists (DUJ) paid tribute to him and demanded that Dalit journalists, who are anyway so few in number, be protected against casteist behaviour of superiors in media organisations. “In the rare scenario that a Dalit journalist is able to enter the upper caste stranglehold of news organisations, let the managements be careful to not exploit or subject these journalists to any sort of discrimination at the work place”, the DUJ release said. 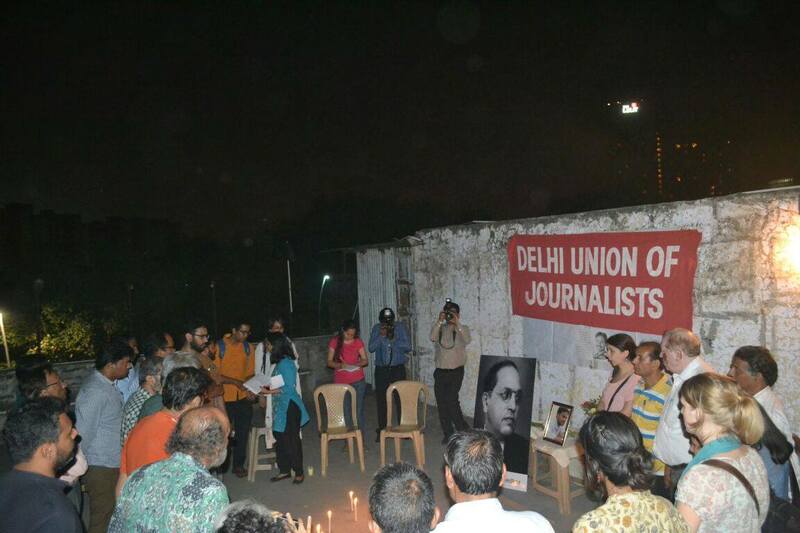 Delhi Union of Journalists organised a memorial meeting for Nagaraju. Some deaths, come flying from above, pushed by the storm of misfortunes, to pierce us below the eyes, where sighs and tears rest. While others nest, all our lives, in a muted corner of our hearts,waiting for the saddest moment to strike from within us. We weep. We write. Some to remember. Some to forget. We huddle in silent spaces, alone, together, with our memories: Of us before, with, and,now, after him. Nagaraju, a rural poor dalit, a Madiga, who broke all the boundaries that didn’t want to be touched sullying the purity of many-a-agrahara, who strenuously climbed the ladders, laden with pieces of broken glass, of the system, held onto it with his remaining breath, while the long arms of an unjust milieu kept tugging, from below, at his legs, weary from fighting all through his life. Nagaraju, a heart wrenching reminder of the efficiency of walls, cemented with bricks of inherited wealth and status, to exclude, and to kill slowly those they couldn’t. Nagaraju, a flowering smile on a wilting face. Nagaraju, a bed ridden hope of faintly filled stomachs. To gentler lands with kinder beings. *Manu is a Hindu Mythological figure who had scripted an extremely prominent text Manusmriti, which codifies the heinous and hideous rules, the Dharma, that should govern the workings of the caste system. Manu, hence, is a widely referenced casteist symbol/icon.